Guth's Lodge - The World's Premier Fly Fishing Destination! Accessible only by air, Guth's Lodge is located on a remote area on the Iliamna river. Each week during the summer fishing season, fisherman return to the lodge to renew friendship, enjoy the majestic scenery that is impossible to capture on film and experience the best sport fishing in the world today. 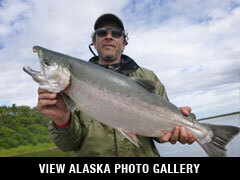 You will fish the Iliamna/Bristol Bay drainages of Southwest Alaska. This area is the premier Rainbow trout and Artic char fishing area of Alaska. Rainbow trout ranging up to 12 pounds are common. Bristol Bay is also the spawning grounds of all five species of Pacific Salmon as well as Arctic Char, Arctic Grayling and Northern Pike. Guth's is located only 15 miles from the Halibut rich salt waters of Lower Cook Inlet where halibut are regularly caught in excess of 100 pounds. The majority of the fishing is stream fishing and is accomplished by wading or by jet boat. A typical week of fishing will offer a variety of fishing opportunities in which you can choose the majority of your daily fishing destinations. Bush wheeled planes are used to reach the remote streams of the Bristol Bay areas and the fresh water streams flowing into lower Cook Inlet. There are also numerous jet outboard equipped river boats on streams throughout Bristol Bay that allow us to fly into and fish the best streams and rivers. $4500.00 per person (double occupancy) plus airfare to Anchorage. $1500.00 deposit may be paid with check, credit card, certified check or money order. Final payments are typically due 60 days prior to departure. Airfare to Anchorage, Anchorage hotels. Fishing license ($55 USD) and King Salmon tag ($30 USD), Liquor, gifts or items of a personal nature. Note: Dates are a rough estimate of times different species of fish are in streams and available to anglers. Weather conditions and water levels can affect when salmon enter the streams from the ocean. Lodge stays run Tuesday to Sunday. Please call us to confirm space availability or to request specific dates. You will fly out from Merrill Field in Anchorage Tuesday morning on a charter flight and you will return to Anchorage the following Sunday. Guth's Lodge holds up to 6 anglers. Guth's lodge is a very family orientated, very comfortable, yet rustic lodges in Alaska. Situated on a remote shores on the Iliamna river, the lodge offers a quiet serenity and fantastic fishing seldom found. Each bedroom is spaciously furnished with two twin size beds and a private bath for your comfort and convenience. The Lodge is constructed with logs and the interior is covered with cedar. You will spend your evenings in the spacious lounge while re-living your days fishing adventures and enjoying your favorite beverage. Several times a week, where locations permit, you will be treated to a shore lunch prepared at your fishing location by the staff. Hors d'oeuvres will be served in the evening before a sumptuously prepared meal. Day 1: (Monday): Hometown-Anchorage. Overnight hotel. Day 2: (Tuesday): Anchorage-Guth's Lodge. Take a cab to Merrill Field. Charter flight to lodge. Overnight lodge. Day 3-8: (Wednesday-Saturday): Full fishing days. Overnight lodge. Day 9: (Sunday): Lodge-Anchorage-Hometown. Charter flight back to Merrill Field. Take a cab to Anchorage International Airport for flight home. Bush / charter flights are weather dependent so it is recommended to book your flight home late in the evening Sunday. Be sure to bring sunscreen and insect repellent and cold weather gear. Note: See your doctor or health clinic. Temperatures range between 40 and 75 degrees Fahrenheit during the season. Because the weather can change rapidly, casual and lightweight layered clothes are recommended along with cold weather gear.